Hello and welcome to Stay at Home Crafter. 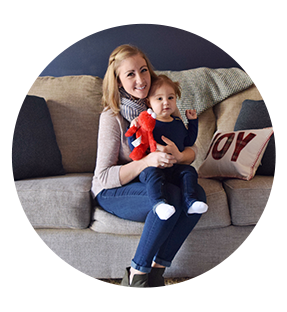 The blog that helps make the journey through mommyhood more colorful with fun (manageable!) craft projects, home décor projects, delicious recipes and so much more. I am so happy you’re here! I am a wife to one awesome man- Christian, a mommy to one incredible little princess named Elliana aka E, Elle Belle, Elli, Bebe (so many nicknames for our girl!) and to one furbaby named Scamp. I stay at home with my babies and wouldn’t trade it for the world. I truly enjoy the adventure that each new day brings spending time with a 15-month-old and her doggy friend. When I’m not chasing down a toddler or reading ‘Brown Bear, Brown Bear What do you See’ for the 20th time 😉, I can usually be found elbow deep in my latest craft project(s). I am a lover of all things crafty, to-do lists, little baby snuggles and vanilla caramel coffee. Grab a cup of coffee and stay a while- I know you’ll love what you find! And while you’re here, shoot me a line to get in touch – I’d love to hear from you!